Hey Garth Brooks, you just finished your first of 11 concerts at Target Center. What are you going to do next? Fly to New York City to appear on “Good Morning America” Friday morning with Robin Roberts and then make it back to Minneapolis for Show No. 2, which starts at 6:30 p.m.
Karyn Rochelle, one of Garth’s backup singers who wrote “Georgia Rain” for Trisha Yearwood, will open the 6:30 p.m. show; the 10:30 p.m. gig will start as soon as a certain percentage of the fans are in the arena. The headliner monitors the ticket scanners. Thursday’s first show started late. It said 7:30 p.m. on the tickets but Garth didn’t hit the stage until 8:43 p.m. And Rochelle played only about 15 minutes, doing four songs – two of which were made famous by others, though she co-wrote “Red High Heels” for Kellie Pickler and “From a Table Away” for Sunny Sweeney. If you read my review, you know that Garth was his same old hammy self on Thursday. 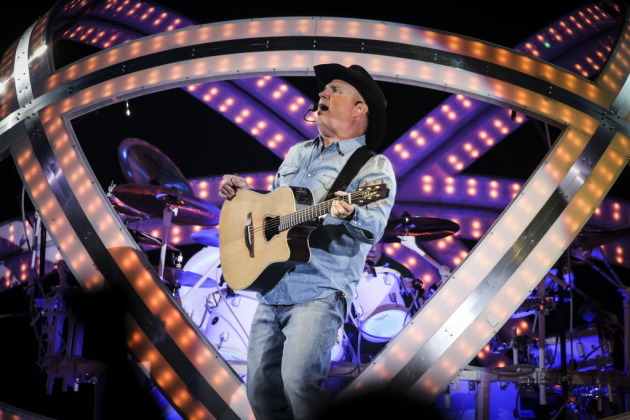 The show might have been a song or three shorter than some of the performances on this Garth Brooks World Tour, which is unrolling slowly, with only four more cities announced thus far after Minneapolis.